The Roanoke Times is the primary newspaper in Southwestern Virginia and is based in Roanoke, Virginia, United States. It is published by Berkshire Hathaway. In addition to its headquarters in Roanoke, it maintains a bureau in Christiansburg, covering the eastern New River Valley and Virginia Tech. According to the 2011 Scarborough “Ranker Report,” The Roanoke Times ranks fifth in the country in terms of percentage of adults reading a newspaper on weekdays in that newspaper's coverage area. The Roanoke Daily Times began publication in 1886. The paper's original owner, M. H. Claytor, eventually added a companion evening newspaper, The Roanoke Evening News. In 1909, he sold the paper to a group headed by banker J. B. Fishburn. The Fishburn group bought the Roanoke Evening World in 1913, merging it with the Evening News and changing its name to the Roanoke World-News. At the same time, Times-World Corporation was formed as the owner of both papers. By 1931, Times-World Corporation had expanded into broadcasting with the purchase of WDBJ (now WFIR), Roanoke's first radio station. It eventually spawned an FM station (now WSLC) and a television station (which still has the WDBJ calls). In 1969, Times-World merged with Landmark Communications, which sold off the broadcasting properties and kept the papers. In 1991, the newspaper became known as The Roanoke Times & World-News when the company stopped publication of the afternoon World-News. The paper dropped the latter part of its name in 1995. Landmark started shopping its newspaper properties in 2008 and sold the Times to Berkshire Hathaway's BH Media Group in 2013. This made the Times a sister publication to the Richmond Times-Dispatch, as well as the News & Advance of Lynchburg, the other major paper serving the Roanoke/Lynchburg media market. International Marketing & Engineering Inc., investigated by The Roanoke Times, 1979, subsequently featured by Harry Reasoner in a CBS 60 Minutes report on the company engaged in deceptive sales practices, whose officers were later sentenced to federal prison. The Roanoke Times was awarded the Virginia Press Association's W. S. Copeland Award for Journalistic Integrity and Community Service, its highest, for the investigation. The award was named after one of the prior owners of the Roanoake Times, Walter Scott Copeland, but was later retitled the "Virginia Press Association Award for Journalistic Integrity and Community Service" to distance itself from its namesake. The November 4, 1985, flood that caused extensive damage around Roanoke and left 10 people dead. The September 22, 2000, shooting at the Backstreet Cafe in downtown Roanoke motivated by the assailant's hatred of the establishment's gay and lesbian clientele. The April 16, 2007, shooting at Virginia Tech, which claimed 32 lives. The February, 2008 resignation of Roanoke City councilman Alfred Dowe. Dowe resigned after The Roanoke Times obtained documents showing that he billed taxpayers twice for some of the nearly $15,000 he spent in 2007 on meals and travel. The Aug. 26, 2015, on-air murders of WDBJ-TV journalists Alison Parker and Adam Ward. ^ "The Roanoke Times". BH Media Group. Archived from the original on 2013-05-31. ^ Matt Chittum (May 30, 2013). "Steady ownership has marked The Roanoke Times' history". Retrieved June 5, 2013. ^ John Reid Blackwell (May 31, 2013). "Berkshire Hathaway buys The Roanoke Times". Richmond Times-Dispatch. Retrieved June 5, 2013. ^ Smith, J. David. "Walter Scott Copeland (1856–1928)". Encyclopedia Virginia. Retrieved 24 June 2015. ^ Hammack, Laurence (February 24, 2008). "Dowe resigns over travel expenses". The Roanoke Times. Archived from the original on November 21, 2013. ^ Times, Roanoke. "User". Roanoke Times. Retrieved 2017-05-02. ^ "Paparazzi | The Roanoke Times". roanoke.mycapture.com. Retrieved 2017-05-02. ^ Times, Rebecca Holland | The Roanoke. "Shoptimist: Rebecca says farewell, previews the weekend". Roanoke Times. Retrieved 2017-05-02. 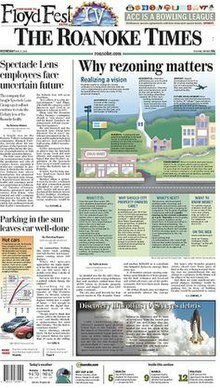 ^ Times, Stephanie Ogilvie | Special to The Roanoke. "So long, farewell ..." Roanoke Times. Retrieved 2017-05-02. ^ Times, David Verde | Special to The Roanoke. "Farewell for now..." Roanoke Times. Retrieved 2017-05-02. This page was last edited on 24 November 2018, at 20:53 (UTC).